How to get massive traction & usage to your product? This post originally appeared on 500 Startups Blog. You build a good quality, attractive, and functional product. You’re proud of it. You tell yourself that your growth curve should always need to be a hockey stick—up and to the right. You assume the motto “If you build it, they will come” will work in any case. That might have worked for Kevin Costner’s character in Field of Dreams, but in the real world, that kind of thinking can cause terrible results for your startup. In a world where most startups die because they do not get enough traction to survive, the importance of sustainable growth should be embraced even more firmly. In May 2013, I gave a presentation in Amsterdam on this same subject, and that presentation was later picked by the Hackernews community, featured by Slideshare, and got nearly 10,000 views. Until last week, I had about 40 people ask me put down in writing the context of this presentation because the slide-deck itself just hit the highlights as I spoke. So, I’ve decided to write this post, and we will be talking through how to get massive traction and usage for your product. No matter what their underlying stories, some products are just awesome enough to attract 25,000 users in their first day (Instagram) or have 50 million users (Waze) over time because of their unique value propositions in the market. This is a subject for an entire post, but let’s focus on the methods applicable to any case, instead of focusing on rare success stories. Build a pyramid around your content: Make sure to have your entire content on the bottom of that pyramid, and start redistributing content by focusing on the keywords that you aim high in search engines. Keep systematically link building: Listen to me: Link building still works for websites to gain better SERP rankings. Make sure to continue systematic link building in your content pyramid—see the example in this slide. The algorithms of search engines might change over time, but keep in mind that you’re dealing with machines that have specific rules, not with people who do SERP rankings all day long. As long as you’re not trying to fool with them by applying some dirty methods, you’ll get what you deserve in time. Use the right schema markup, depending on your content: When used correctly, schema markup can greatly increase your SERP visibility and presence. You must first select the appropriate markup, depending on your content type. I will give two examples: Do you have video content? Use the video schema markup to get results such as this. Try to be creative: Do you have song information from Madonna as your content? Make her the page author or, even better, include an official video with video schema markup to the related item—and watch the results over time. 1st rule: Social media is not about YOU. 2nc rule: Social media IS NOT about YOU. 3rd rule: It’s about THEM. 4th rule: You have to keep them in loop by giving INTERESTING CONTENT. Always keep those four rules in mind when planning your social media game plan thoroughly. Each social media platform has its of different characteristics, so the best thing you can do is to have different game plans for different social media platforms. Twitter: Try to engage with the thought leaders of your market. Get them to retweet your content. Consider creating imaginary characters in your niche such as FAKEGRIMLOCK or Startup L. Jackson. Be as creative as possible with 140 characters, making sure to properly encourage your existing website audience to tweet your content. See this example. Facebook: Keeping your targeted audience in mind, run experiments—not only on your official Facebook page but also with related pages that you create for your audience. Is your startup a community for geeks? Slowly grow another Facebook page where people claim “I love science.” Is your startup about web developers? Do the same with another page where the fan base claims “I am a programmer and have no life.” You get the point. Now get started! Don’t forget the above rules. Pinterest: It’s no surprise that the majority of the Pinterest users are women who are into visually attractive items. The least you can do for Pinterest is to be a contributor to popular boards related to your target audience. Keep feeding those boards over time. Stumbleupon, Reddit etc. : Platforms such as these are driven by a combination of some algorithms, and the contribution of their audiences. Find your target boards and channels, and try to build an initial existence. Once you start getting initial traffic, display some indicators to your incoming visitors from these platforms to nudge your content items back to the platforms. Once you do that, invest in your strength on those platforms. Rinse and repeat this process! Quora: Quora works best for specific cases, such as SAAS products. Have someone on your team to answer related questions for your market. If you have one killer feature you can use to your advantage, make sure there’s a question about that pain point and do your best when answering it. You can even ask your existing customers to answer those questions while indicating how awesome you are. Create content directly or indirectly related to your audience. If your product is about helping people lose weight, blog about all those tips and tricks—scientific facts that anyone can use in their lives on a regular basis. Reach another popular bloggers in your niche, asking them to redistribute their posts with your stamp. Do the same for other popular publishers in your market. Use HARO (Help a Reporter Out). Rather than trying to guess what the press is going to write, help them out—even if it’s not related to your niche. If it’s related, ask the reporter to redistribute that content piece on your company blog. Do your content syndication at first. You have your Tumblr, Quora Blog, your Medium account on which you can post some of your content that’s related to your audience on those specific platforms. Even if you’re just getting started, create a schedule to redistribute your content on various content platforms. Leverage the content recommendation platforms. We are currently building one, but there are a few other platforms you can use to syndicate or promote your content. It’s not something you can achieve overnight, but it will get better as you keep doing this. As you get better, you can start asking around to get your content syndicated with the big publishers in your market. Welcome them personally. Make sure you send an email to your recent user a few hours after they sign up, offering personal help from someone on your team, preferably one of the founders. Make sure to have condition-based triggers such as sessions, steps. Think with a pirate mindset (AAARR), and define the most important data points for your activation stage. Encourage your users to complete those steps to increase activation rates in general. 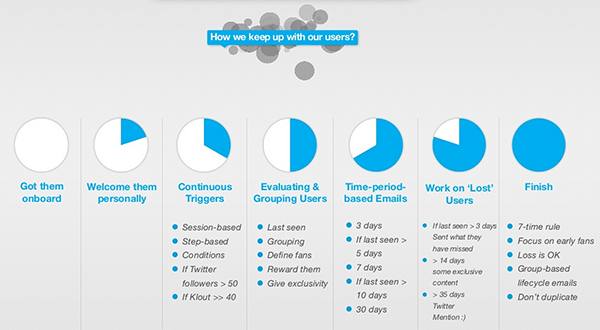 Group your users, and reward your loyal users. Don’t be surprised by the fact that, in most web communities, 95% of the total audience are actually lurkers, followers, and wallflowers. It’s your job to reward power users, so use these emails to reward and give exclusivity to those users. Use time-period-based emails. This is your turn to increase retention rates by encouraging your not-so-active users. Don’t email a user more than once, but make sure to use multiple time periods (i.e., if last seen > 5 days, if last seen > 7 days). Feel free to use this method to educate your users, especially if you’re trying to sell something (i.e., 7 days after signup date, 30 days after signup date). The Rule of Seven. This old marketing adage says that a prospect needs to see or hear your marketing message at least seven times before they take action and buy from you. Use this rule when planning your emails. 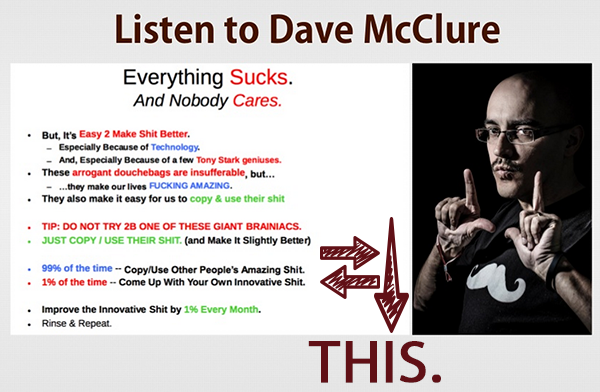 The last piece of advice comes from Sith Lord Dave McClure. Call them “growth hacking” or something else, these techniques—or relatively similar ones—have been around for years. They are not rocket science. Do not try to reinvent the wheel when it comes to planning your sustainable growth. Use what fits your product from these techniques and then use 1% of your time to create your own innovation on these techniques. Keep doing this by improving your innovation 1% every month. You’ll be amazed by the results! According to Paul Singh from Dashboard.io & 500 Startups, in this decade—at least for Internet startups—traction is the only thing that’s defensible anymore. According to Ash Fontana from AngelList, traction trumps even team and vision when going for The Million Dollar Round. Be a lean startup, but don’t use it as an excuse to not take sales and marketing seriously. It’s not a surprise that VCs would love to fuel your growth, so focus on traction as early as possible, and spend dedicated time on applying different techniques. Good luck! co-founder of @Limk “Smarter Content Recommendations” @500startups, @startupchile, @thenextweb, @rockstartaccel alumni, self-taught & full-stack developer.